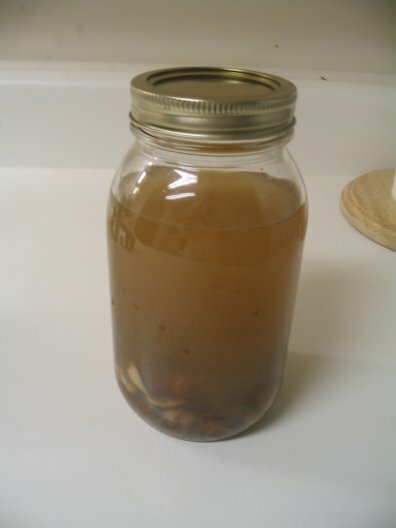 This week's vodka infusion is ginger. 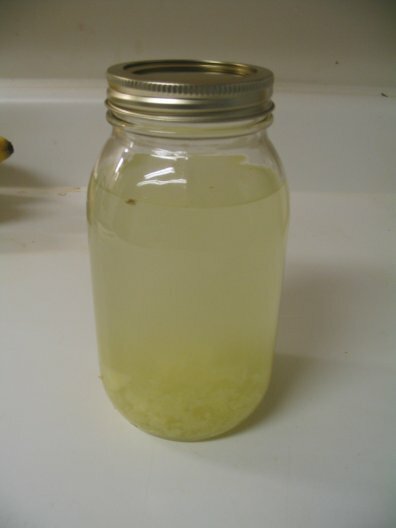 We used part of a fresh ginger root, though we are not sure of the exact amount used. It's about half of one of the ginger roots you can buy in your grocery store's produce section. Wayland whittled away at the skin of the root, removing it to expose the yellow ginger. With the other half of the root, he made a neato soap carving of a bear. The next step required a bit of a judgement call. We did some research on ginger-infused vodka, and found that some prefer to slice their ginger thinly, while others grate it. The more surface area is exposed, the stronger the flavor will be and the faster the infusion will be complete. 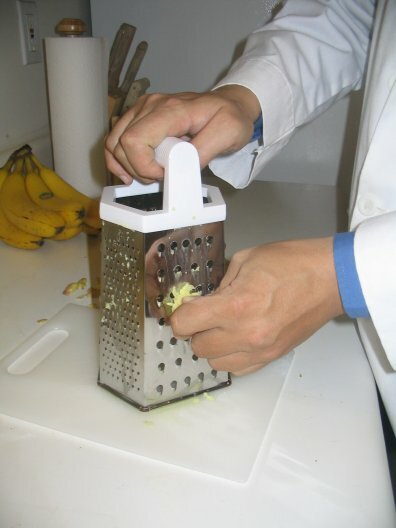 Since we also learned that ginger can be a slow infusion, we opted for coarse grating. 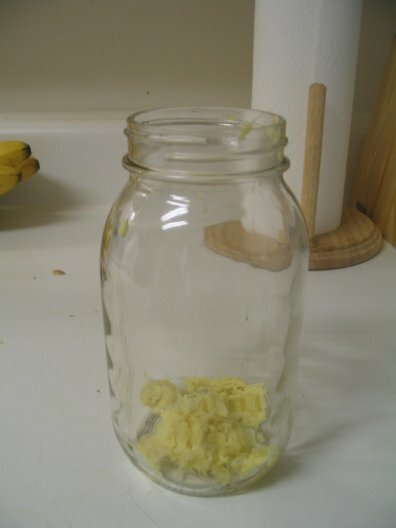 The amount of grated ginger root rendered was enough to just cover the bottom of the science jar. Grating the ginger caused it to release some juice, so when the ginger and vodka were combined, the vodka immediately attained a yellow haze. We are, of course, hoping that we made the right choice in grating the ginger, and that it won't be overpoweringly tangy. If you are following us at home and prefer a lighter flavor, we recommend you slice the root thinly. We'll find out soon enough whether this turns out well. We've had a few comments recently on our vodka filtration process and how often we change our filter. For those just tuning in, all of our vodka infusion experiments make use of bottom-shelf Vladimir vodka, which we cycle through a Pur water filter to remove the impurities, a method developed by the scienticians at Oh My God It Burns!. Though others have repeated this experiment with mixed results, we find that by cycling the Vladimir through the filter five times, we can upgrade it to a fairly smooth and crisp middle-shelf equivalent (think Absolut, not Ketel One). 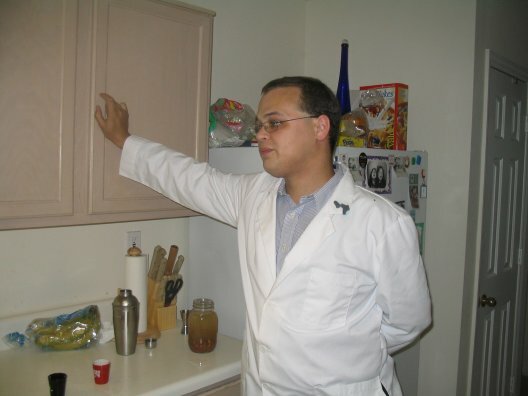 Since any remaining impurity is usually masked well by our infusions, this is sufficient for our purposes. We replace our filter on a monthly basis. At one infusion per week, Scottes from Scottes' Rum Pages rightly determined that we subject each filter to roughly 4 gallons of use (5 filtrations per infusion * 25.4oz per bottle * 4 infusions per month = 508 ounces). In contrast, Pur and Brita filters are rated for up to 40 gallons of tap water. Keep in mind, however, that we also repeat some infusions to replenish our supplies. These repeat infusions are not always reported on the site. Though Wayland and I have cut back our drinking a bit since starting Infusions of Grandeur (gasp! 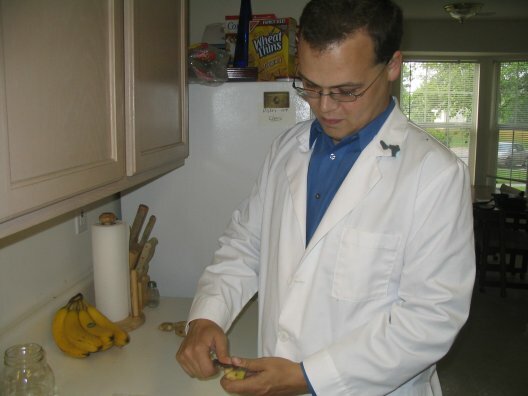 ), there are a few staple flavors we go through somewhat regularly. In addition, the practice of using some of our vodkae (particularly garlic and jalapeño) as a marinade has become somewhat common. I estimate that these repeats increase the filter usage to 6 or 8 gallons per month, depending on whether we throw a party in any given month. This still seems to be a small amount, based on the filters' official ratings. However, we do notice a slight drop in quality as we approach the end of a month. In fact, we were overdue to change the filter during our disastrous second batch of strawberry, which may well have contributed to the unfortunate results. 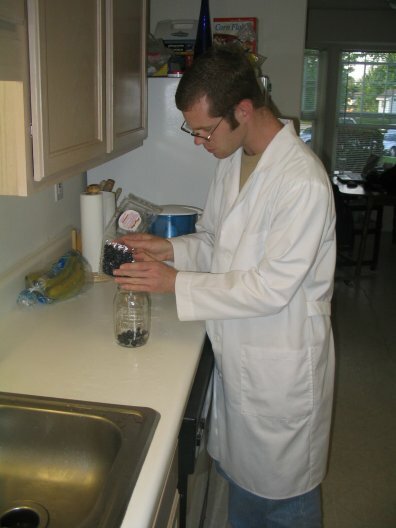 Tap water filters contain activated carbon, which adsorbs impurities but does not bind to water or alcohol. (Note that adsorption is not the same as absorption.) Vladimir vodka is pretty vile stuff, and we presume it has a higher concentration of impurities than average tap water. 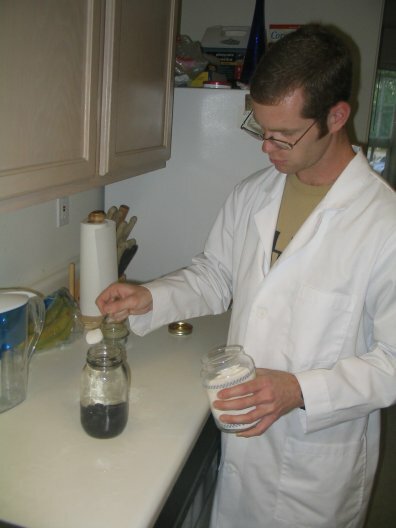 As a result, the surface area of the activated carbon becomes saturated at a much faster rate. If we were filtering a higher quality vodka, it is likely we could get nearly as much use from the filters as we might with tap water; but when using a low-quality vodka such as Vladimir (and that's when you really need the filter anyway), the filter must be replaced on a much more regular basis. Addendum: I've been informed that the fine scienticians at MythBusters have attempted vodka filtration and declared it a myth. I haven't seen the episode in question, so I cannot evaluate the methodology they used. However, I can say from our experience at the Infusions lab that it does improve the quality of bad vodka to a tremendous extent. Again, however, it takes about five filtrations to do so, and it's still not top-shelf caliber. 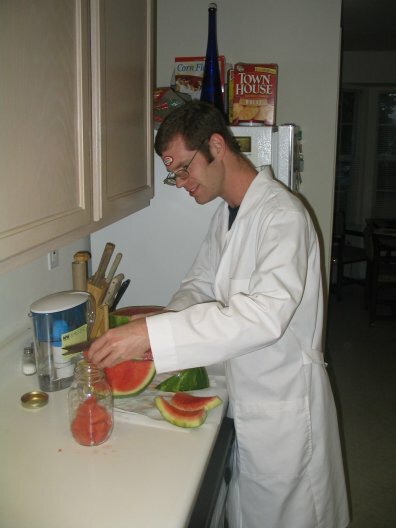 Last night, the Mad Scienticians conducted the first sampling of our watermelon vodka infusion, as well as repeated samplings of the blueberry and almond vodkae. 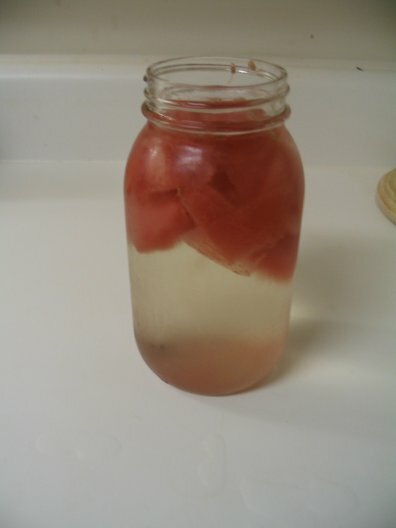 The watermelon vodka experiment had only been ongoing for three days, we expected it to be a fairly quick infusion. As we expected, the vodka has drawn very little color from the fruit. 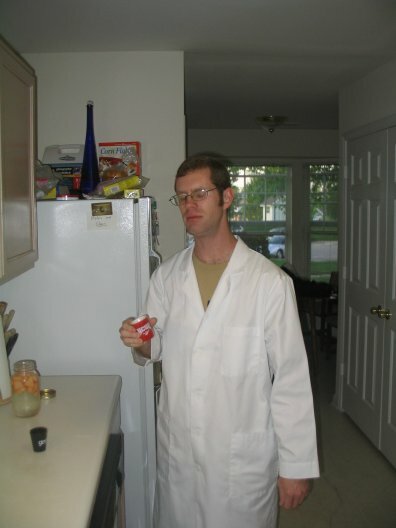 It turns out that the experiment will need more time than we had hoped. "It's got a watermelon flavor, but it's not strong enough," Wayland commented. "It's also got a bad aftertaste." I didn't notice an aftertaste, other than the bite of the vodka. The watermelon is tasty on the front end, but it subsides quickly. We put this back to infuse for another week. The blueberry vodka has progressed a great deal since our previous sampling. Once the berry skins were broken up, they began to truly infuse. The vodka now has a deep purple color. I found the blueberry flavor to be more pronounced, but it still had a strong vodka taste. Wayland said he hardly tasted any blueberry, and it was mostly vodka. So, despite the strong coloration, this infusion still needs more time before the flavor is right. The almond vodka, which has been running for four weeks now, has also attained a darker color than it had last week. "More almondy, very smooth," said Wayland. "Still, I'd like to give it a little longer." I concurred with Wayland. Its almond flavor has grown stronger, but not as much as we would like. Alas, this experiment too will remain ongoing. We have high hopes that this one will be completed next week, though. Though all of the experiments we tested this week have been disappointments so far, we do have a cocktail recipe to make up for it, using the strawberry-vanilla vodka we completed last week. This mix of flavors is oddly reminiscent of sweet iced tea, with a hint of strawberry. We named the drink in honor of our local area, the Research Triangle of North Carolina. Before we head into this week's experiment, an apology. 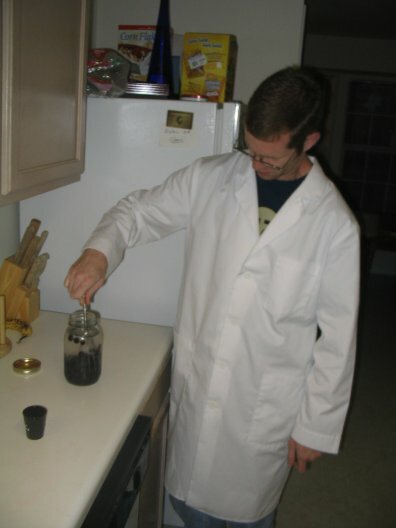 Last week, for the first time in our five month history, the Mad Scienticians failed to start a new weekly vodka infusion. We are deeply shamed by our failure, and briefly considered seppuku, but that would have prevented us from bringing you this week's refreshing summer infusion: watermelon vodka. 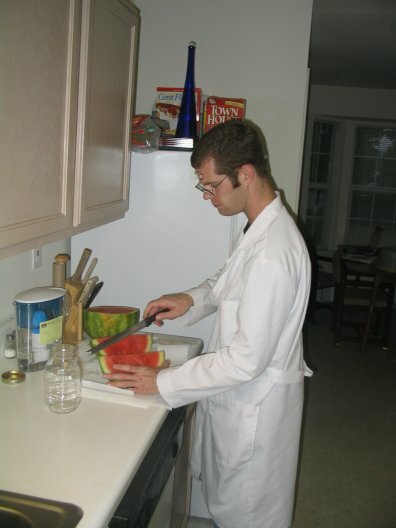 For this experiment, we used about three-eighths of a seedless watermelon. Though seedless watermelons are a lot less fun to eat, the seeds would have introduced an unknown flavor variable to the infusion. We sliced the watermelon into wedges, each wedge comprising about one eighth of the melon. We don't expect this infusion to take terribly long, so we'll sample it later this week. Last night, we conducted taste tests of our three ongoing infused vodka experiments. 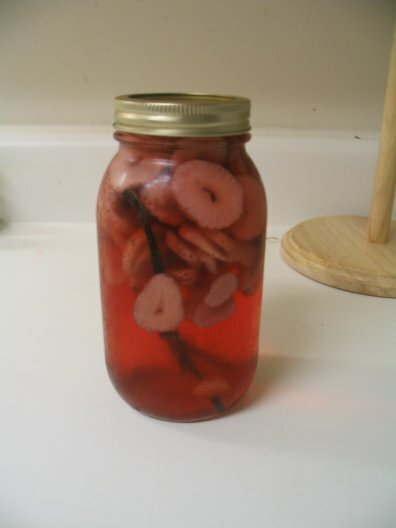 We began with the most recent, strawberry-vanilla vodka, which had infused for five days. As with our previous strawberry experiments, the vodka drew out most of the strawberries' color, leaving a bright red vodka and pinkish-white berry slices. The split vanilla bean had no noticeable effect on the color. Since our strawberry vodka is easily masked in cocktails, we expected the vanilla flavor to slightly overpower the strawberry. In truth, the opposite occurred. 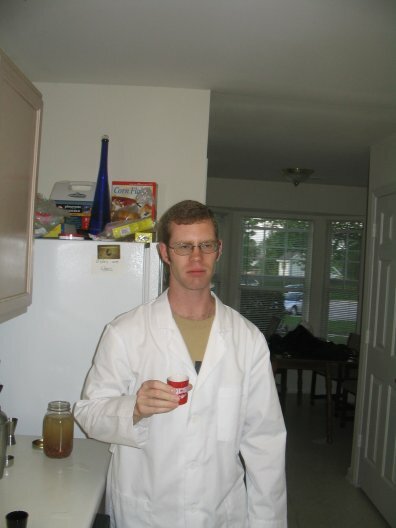 "The strawberry flavor is even stronger than in the regular strawberry vodka," Wayland noted. 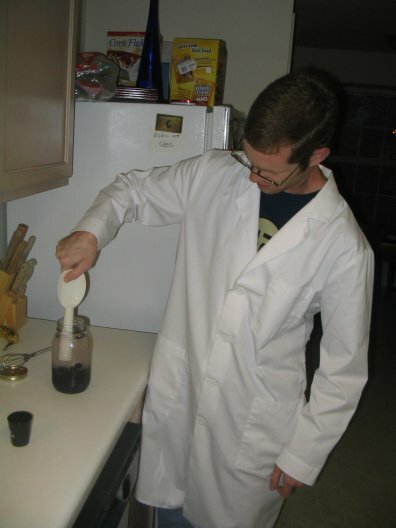 "The vanilla is a little faint." We think that the difference is in the quality of the strawberries. Since they are now in season, the berries are fresher and more flavorful than the ones we have used previously, leading to a stronger infusion. In fact, even the color is richer, seen in this side-by-side comparison of our previous batch of strawberry and the new strawberry-vanilla. We considered letting it infuse longer, but since vanilla is a very time-sensitive infusible, we decided to err on the side of a lighter flavor than too strong of one. Next, we sampled the blueberry vodka, which has been ongoing for two weeks. 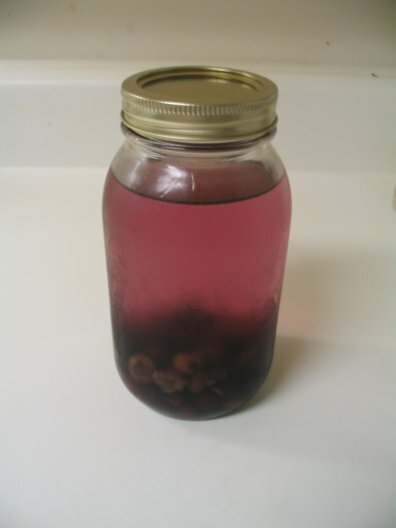 The blueberries have imparted almost no color on the vodka. Likewise, they have not imparted any flavor either. All of our early research stated that infused berries (excepting strawberries) should be left whole; however, this experiment, along with our grape vodka experiment, seem to disprove this hypothesis. Rather than removing the blueberries and bruising them by hand, we decided it would be more efficient to haphazardly crush them in the jar. However, it took some trial and error to find the proper implement for the task. I began with a metal whisk. The whisk was completely ineffective. The berries simply slipped between the wires, escaping any direct force. Next, I tried using the flat-ended handle of a plastic rice spoon. This should have worked, but for one weakness: the handle wasn't long enough. 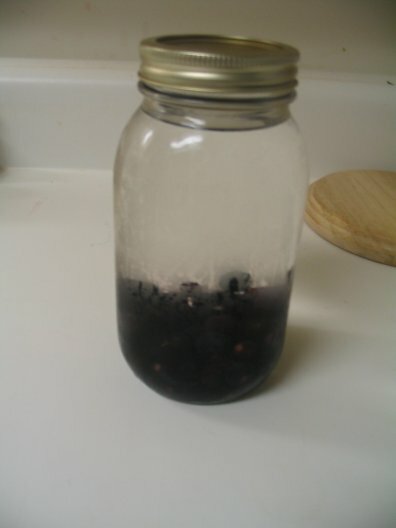 The wide section stopped at the mouth of the jar, leaving a mere half inch of space under the handle, just enough for the berries to avoid damage. Wayland then retrieved a long bread knife with two prongs on the end. This did the trick nicely. 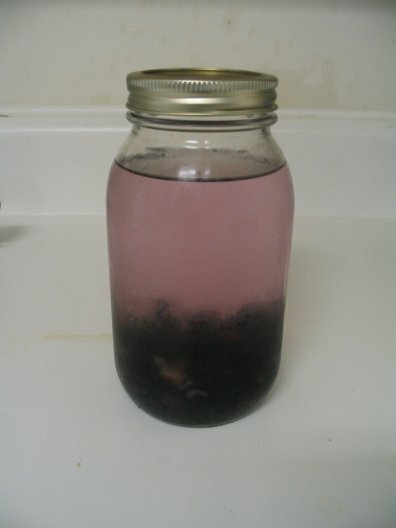 The effectiveness of rupturing the blueberries was seen within moments, as the vodka began to attain a purple hue. We'll try it again in a week, now that it is truly infusing. 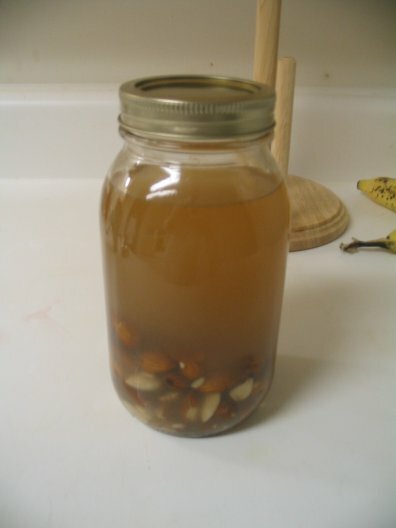 Lastly, we sampled the almond vodka experiment for the second time. This infusion has been running for three weeks. Similarly to the blueberry experiment, the almond vodka had little flavor in the first tasting, so we crushed the almonds a bit. That was about a week and a half ago. Now, the vodka is very cloudy, though much of this is dust that probably ought to be filtered out. We chilled a sample and filtered it through cheesecloth before tasting. The flavor is much stronger now than it was previously, though it has yet to reach its full potential. We fear that this will be another long-term infusion, like the coconut vodka, but we will continue to sample it and keep you updated. Here at the lab, the Mad Scienticians often organize our thoughts using our trusty whiteboard. 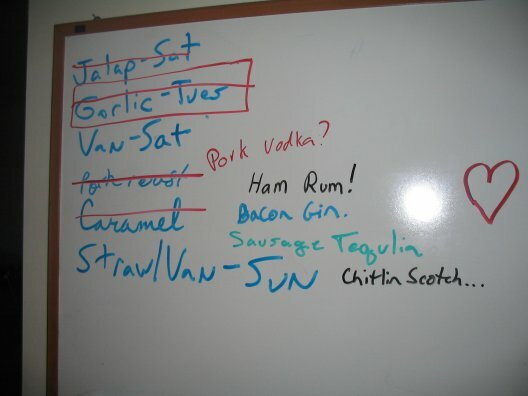 We usually keep a to do list, which recently consisted almost entirely of ongoing vodka infusions, both experimental and repeated. The sole exception on the list was a pork loin we had purchased to cut into roasts, but hadn't gotten around to yet. 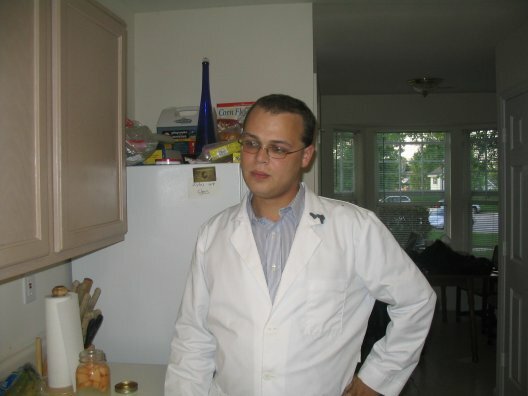 We had a party last weekend to celebrate my college graduation, and the juxtaposition was too odd for our guests to resist, leading to a meme of disturbing proportions (though not entirely unheard of). Two for one combo deal! We've been talking about doing a dual-flavor vodka infusion for a while, but we've wanting to stick with flavors that we already know are successful solo. At this point, we feel that we have a pretty broad base of infusions to experiment with, and are ready to start mixing it up. This doesn't mean we're going to stop creating new flavors; on the contrary, we've got several planned for the next few weeks. 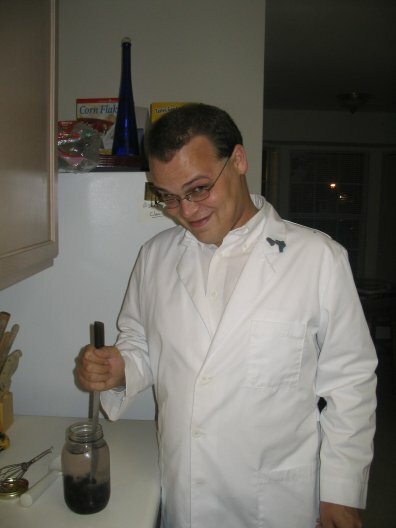 But we'll probably try a new combo every three or four experiments or so. 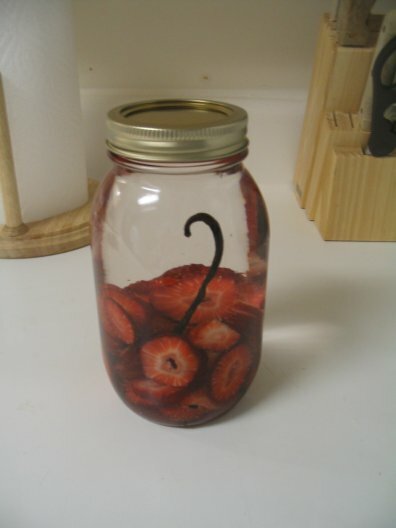 This week, we're attempting to create vanilla strawberry vodka. 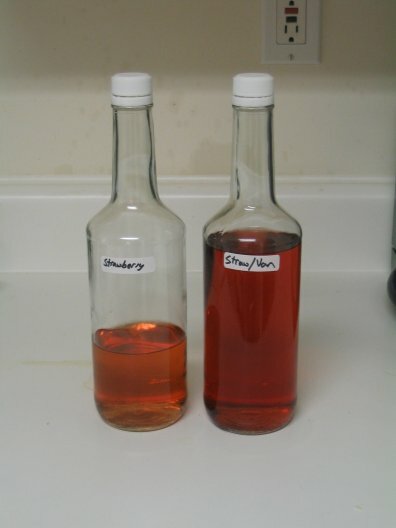 By pure chance, the original strawberry and vanilla vodka experiments each ran for exactly four days, so the timing of this experiment is easy. Some future dual-infusion experiments will have to be offset, with one ingredient added several days or longer after the first. 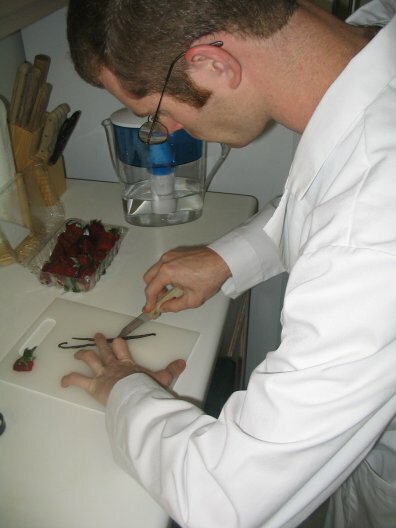 We began this experiment by slicing one vanilla bean in half lengthwise. 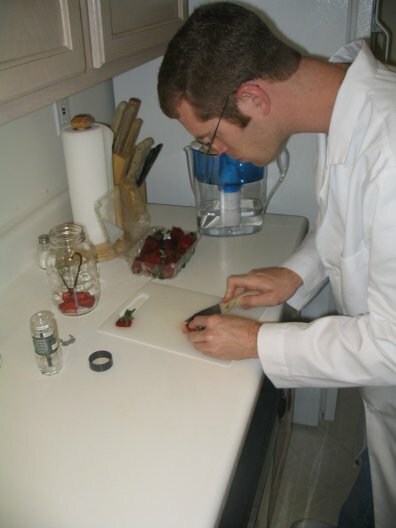 Next, we thinly sliced ten fresh, rinsed strawberries, discarding the leafy tops. The strawberry slices tend to float, so we put the vanilla bean halves in first, to ensure the berries don't push them up over the surface of the vodka. Then, we added the filtered vodka. The strawberries did not float at first. By the morning, however, they had risen to the top, and the vodka was already bright red. We're looking forward to this one's results. Yesterday, we conducted tests of our cantaloupe and almond vodka experiments. I also debuted my newest shotglass, from North Carolina State University, to celebrate my impending graduation! And it was so smooth, it put me right to sleep! Or I may just be exhausted from exams, though my personal hypothesis is that I simply blinked at the wrong moment. The point, however, is that this vodka is pretty tasty. It's got a slight, late vodka burn, but otherwise a nice, slightly sweet cantaloupe taste. Wayland's reaction was much the same. "It's got a vodka taste on the back end, but otherwise very smooth. The cantaloupe taste is strong on the front end." We're calling this one a success. Next comes the hard part, figuring out what kind of drink to put it in; but that will have to wait until another post. We also tested the ongoing almond experiment, simply as a benchmark; after a mere week, we had no expectation that it would be ready. 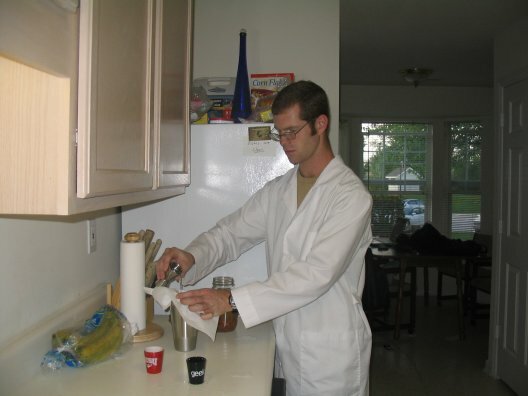 Since the vodka contained a swirling abundance of almond dust, we filtered the sample through a paper towel, then chilled it in a shaker before drinking. It was Wayland's turn to take the first shot, and as expected, it left much to be desired. "There's only a touch of almond in there," Wayland said, "but not much vodka taste either. It definitely needs more time." I could barely even taste the touch of almond Wayland noted, but it was in there, hiding just out of reach. I was surprised at how smooth the vodka had become, despite the lack of taste. We learned from this tasting that the infusion will likely take much longer at this rate. This, combined with the suggestions from our readers that crushed almonds would have been a better option than whole, inspired us to give the experiment a little push along the way. I reached into the jar using a detached beater from an electric mixer, and crushed the almonds as much as my limited leverage would allow. Hopefully, this will speed up the process a bit, though it will still take time. We'll try it again in another week and see where it is. We decided to create blueberry vodka for this week's experiment. We are infusing a fifth of vodka with one 4.4 ounce package of fresh blueberries, less a few that the Mad Scienticians ate during the process. Once the vodka was poured in, we added a spoonful of sugar to the jar to help set the infusion and make it a little sweeter. Just like ol' Brick Top! This infusion should take about a week. Stay tuned tomorrow for our canteloupe and almond tastings!